Ever since Elvis Presley's death in 1977, there have been more movies made about him then you can shake a stick at. According to IMDb, a total of 43 actors have portrayed the King on screen, including Val Kilmer, Harvey Keitel, and Kurt Russell. One of the best performances, in my opinion, was by Jonathan Rhys Meyers in the 2005 TV movie Elvis. I thought that he looked like Elvis, spoke like him (I was even more impressed once I learned that Meyers is British), and swiveled his hips like him. Definitely at the top of the heap. So who would be at the bottom? Well, I haven't seen too many of the other films for a fair comparison, but Don Johnson's portrayal in the 1981 TV movie Elvis and the Beauty Queen has to be one of the worst. Now, if you saw my post from last week, Young Don Johnson Was Ridiculously Smoking Hot, then you know I like the guy. However, to paraphrase a comment I saw on YouTube under the movie, "Don Johnson playing Elvis Presley is like Colin Farrell playing Sonny Crockett." It isn't Johnson's fault -- after all, someone cast him for this movie. But it doesn't take a genius to see that he doesn't even remotely resemble or sound like Elvis Presley. He can get away with it while wearing the full Elvis regalia -- bad wig, sideburns, sequined jumpsuits, and oversized sunglasses. In fact, if you saw him at a Halloween party dressed this way you'd be inclined to shout out, "Hey Donnie, love the Elvis costume!" But this is a movie...albeit a TV one...and once the sunglasses come off, he pretty much looks and sounds like Sonny Crockett undercover as an Elvis impersonator. He also plays the role at his most Don Johnson-y, the charming mid-Western Missouri boy making jokes and flashing his devilish smile a little too often. The most unintentionally funny moments in the movie come when he lip-syncs to Elvis' real singing voice. One minute he's speaking like Don Johnson, the next minute he's mouthing the words to Elvis' rendition of "First Time Ever I Saw Your Face." 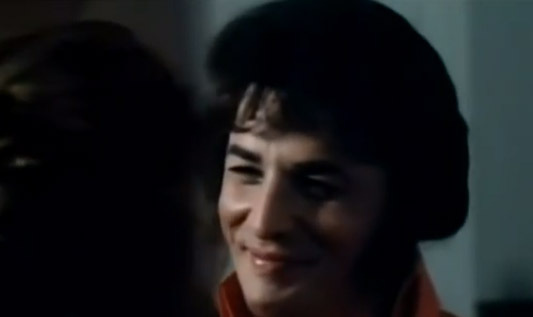 The stark contrast between Elvis' voice and Johnson's only reinforces how he was the wrong actor for the role. Nonetheless, this is still an OK film, especially if -- like me -- you occasionally miss the entertaining movies that were made for television in the '80s. 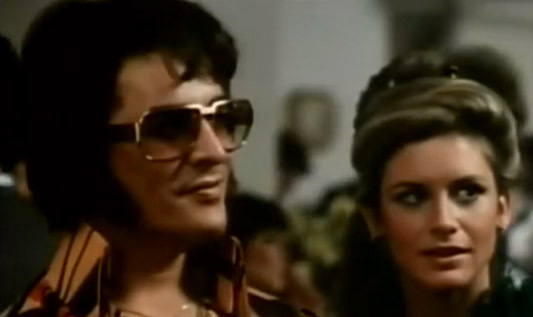 Elvis and the Beauty Queen is about the relationship between Presley and Linda Thompson, a Memphis beauty pageant winner (Miss Tennessee) and later actress who began dating Elvis during his separation from wife Priscilla Presley. The relationship lasted for four years -- from 1972 to 1976. Stephanie Zimbalist of Remington Steele fame plays Thompson and come to think of it, while she's pretty, I don't think she much resembles the real-life Thompson, but it's still a closer match then Johnson and Presley. Things progress pretty quickly from there, and Jeannie and Linda's aunt Betty (Ann Wedgeworth) are over the moon, acting like orgasmic giggly teenagers at the prospect of Elvis' interest in Linda with every phone call, word, and relationship development. Linda is also a little naive. 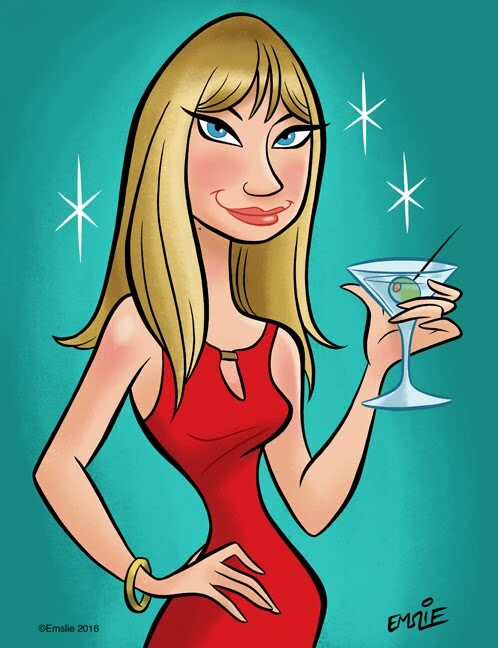 She was only 22 when she met Elvis and a virgin, something that the movie doesn't downplay. As a Southern Baptist girl, she wants to save herself for her wedding night. So when Elvis invites her to Las Vegas, she gets a taste of reality. The female fans in the audience are screaming and throwing undergarments at him, and he gets railroaded after the show by a melodramatic lady who calls herself Su-Su. But the biggest wake-up call is when Linda learns she is to share the same hotel room as Elvis. She insists on a separate room, explaining her reasons, but Elvis is equally insistent on having her room with him, later reassuring her that he won't take advantage of her. Before they consummate the relationship, Linda also gets a glimpse of the portable medicine cabinet Elvis carries with him; pills that help him sleep and pills that wake him up. When she has a headache he gives her two tablets that he claims are aspirin, but end up causing her to fall asleep and stay that way through the whole night. Linda soon finds herself immersed in the King's world -- a never-ending routine of concerts and after-parties that include other women flirting with her famous boyfriend. Elvis sleeps during the day and one day when he begins breathing erratically and can't wake up, Linda has him admitted to the hospital. During his hospital stay she walks into his room carrying a giant teddy bear and witnesses a Benny Hill fantasy come to life -- a nurse is kissing Elvis (who then delivers the lamest excuse ever: that she was just "taking his temperature") to which Linda simply replies, "hot." Needless to say, there are no earth-shattering secrets revealed in the movie and the plot is rather simplistic. We all know that Elvis was addicted to prescription pills and fooled around with other women. Linda begins to realize that having one of the biggest stars on the planet for a boyfriend isn't all that it's cracked up to be; he isn't marriage or father material and is constantly on drugs. One night, a stoned Elvis is playing around with a loaded gun in the hotel suite and nearly shoots Linda when he throws it at her in a fit of rage. And even that isn't the breaking point. Linda feels guilty because Elvis gave her brother Sam a job as one of his bodyguards. In the meantime, she's gotten close to David Briggs (Rick Lenz), one of the studio musicians in Elvis' band who seems like a genuinely nice guy with a normal lifestyle. Eventually, after seeing Elvis trying to self destruct too many times, Linda and the King realize that their relationship has run its course and they end up parting as friends, with Elvis giving Linda a diamond necklace. As for the movie, it has an IMDB rating of 4.4 stars out of 10; I honestly didn't think it was that bad, but OK, it wasn't great, either. But at least now if the question ever comes up in a trivia contest or you want to impress your friends, you can say with authority that Don Johnson played Elvis in a movie. And if you're so inclined, you can view it here on YouTube.